The Micropen is an automated microdermabrasion technology that enables us to accurately treat the skin from a vertical angle – helping to deliver the best treatment possible. The MicroPen is an innovative technology that use microneedling to treat the appearance of fine lines, acne scarring and improve the skin’s texture, tone and colour. The MicroPen is an advancement over traditional dermal needling rollers – allowing for better precision when treating the skin. With the MicroPen we can target the skin on a 90° angle which helps to improve comfort during the treatment and boosts the consistency of microneedling results. As the MicroPen does not use heat, patients may have less redness than they would with a laser treatment. Laser and the MicroPen are both great technologies – ask us about which option will be best for you. The MicroPen uses 12 tiny micro-points to make holes in the skin surface. The needling action causes the skin to trigger a healing effect where it will create new collagen and elastin to even out the surface. A second benefit of microneedling is that it creates ‘micro channels’ in the skin surface, helping your skin care products to penetrate and absorb deeping in the skin layers. 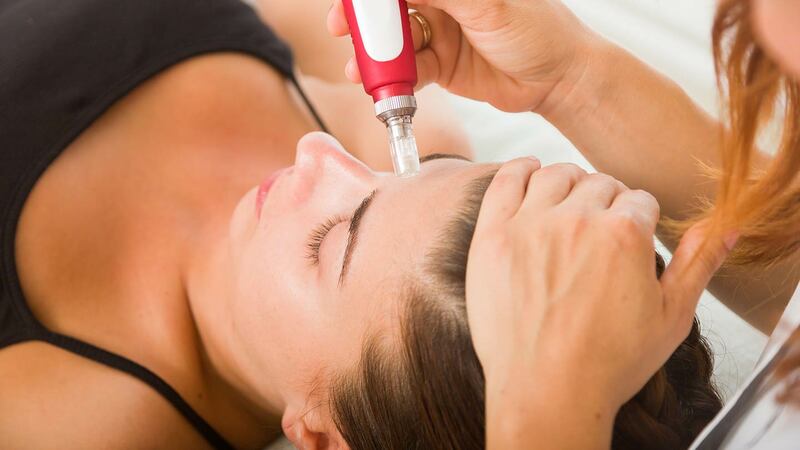 When having microneedling done, our staff will use a thin layer of saline solution to lubricate the skin while they gently pass the MicroPen over the treatment area. The treatment typically takes somewhere between 15-30 minutes depending on the size of the area. After the treatment is complete, there will be minor redness – usually lasting 24-48 hours.